Click on the links below to read the latest news from Dial Before You Dig. If you would like to stay up to date on the latest news from Dial Before You Dig, follow us on Social Media (see below, Connect With Us) or subscribe to the Dial Before You Dig newsletter which can be found on the homepage under “Subscribe”. 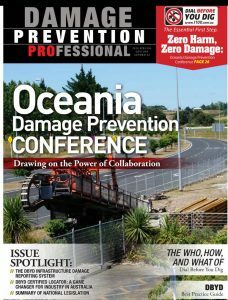 A special Australian edition of the Damage Prevention Professional Magazine was released to promote the upcoming Oceania Damage Prevention Conference. The content is specifically tailored for Australian stakeholders serious about damage prevention and the issues faced in the industry. The magazine is a must read for anyone serious about damage prevention intiatives. 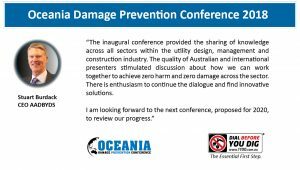 The content will be revised after the Oceania Damage Prevention Conference to ensure that it is current. 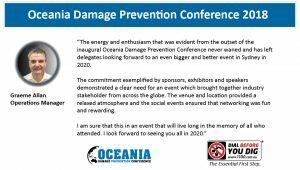 Highlights from the Oceania Damage Prevention Conference held on the Gold Coast. Thank you to all our sponsors, exhibitors and delegates, the conference would not have been possible without you.